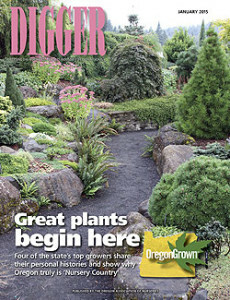 On the cover: The Jean Iseli Memorial Garden at Iseli Nursery in Boring, Oregon, lets people see dwarf conifers, taller conifers, Japanese maples and other plants in an attractive setting. You can also read this month’s complete flipbook edition of Digger (Flash required; fast connection recommended). Please send your comments on the issue to editor Curt Kipp at ckipp@oan.org.